I think I loved Pivot Point more than I loved Split Second; however, I'm sure that I love the developments and new characters introduced in Split Second even more. Pivot Point was more of an emotional undertone and Split Second seems to be projecting more of an intriguing, suspenseful plot device. In spite of that, both had a nice sub-plot of a mystery along for the ride as you watched the characters grow and develop. 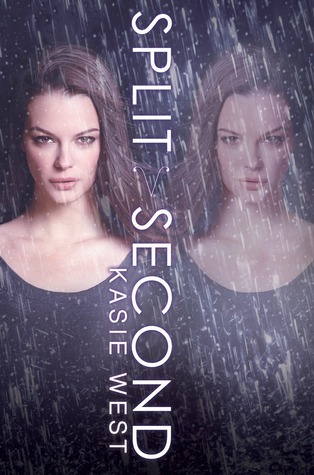 Kasie West has this amazing tendency towards the dry, sarcastic humor and effortless amusement in her writing tone. It's so much fun that I'm almost convinced that she writes specifically for people like me who enjoy a good helping of dry humor. On top of that, the creativity of her Pivot Point world is amazing. Once again, one of my favorite devices happens to be of the "hidden world/secret organization" scenario where our main character has to keep her secrets for obvious reasons, all while still trying to blend into the normal world of society. Split Second had a bit less of that scenario than Pivot Point did, because we were following a different direction for the story, but it was still the basis of this series after all. Of course, the first few chapters that involved Addie's "superhero" reflexes was kind of exciting. She gets to be "The Flash" and save lives and money boxes while attempting the rebellious teenager act. I don't recall how much I loved the characters of the Pivot Point world before, but now I'm certain that I have totally fallen in love with them. If I had thought Addie was a great character with all her nerdy, book-loving, OCD-ness, then I love her even more now; especially being able to see her from a different person's point of view. Seeing as how she dies on one side of the Search, and betrays Addie's trust in the other side of the Search. But I'm kind of glad that we get to see Laila's perspective of the world, because this reckless, gloomy personality (sans that self-destructive-ness now that she's seemed to mature quite a bit since the first book) appears to present itself in a more endearing manner. At least, to me, I like Laila a whole lot more than I did before and actually find her pretty amusing to follow. She's sassy, she's strong, and her whole recklessness was actually kind of fun and adorable... in some ways. In fact, I found myself a bit more interested in the "Laila" part of the story more so than Addie's; though that's not to say that I didn't find interest in Addie's part of the story. It could also be that we get to meet Connor... who is all sorts of "Yay!" and together, he and Laila make an extremely fitted and cute couple; this caused me to admit that I really loved Laila and Connor together more than I loved the Addie/Trevor combination, even though both are good and unique in their own ways. It's just.... Addie and Trevor already had their story from the first book, so Connor and Laila made for a refreshing new romance. At the same time, I still loved the Addie/Trevor romance because of the situation they've been put into--so we get to watch the two of them fall in love all over again and see their reactions to the "coulda been" romance if things had happened differently. Connor was a nice addition to the story, starting off as some random guy who almost runs Addie over with a motorcycle, to becoming the shady provider of illegal advanced ability contraband, up to the point he starts to become Laila's love interest (which made me gush and squee... I'm not going to deny it). I'm only disappointed we didn't get to see more of him. There were a lot of other little details that I loved about Split Second that I thought had been handled quite well. For instance, the "reliving" a life that we (as the readers) have already seen in a different timeline with different events when Addie visits her father in the Norm world of Dallas, Texas. Whereas she and Trevor's ex-girlfriend were love rivals and hated each other in the first book, they start off as good friends since Stephanie is the first teen she meets when she arrives in Dallas. I loved that despite the time frame being different and despite a few minor changes in events, the way that characters react to situations are still faithful to their original personalities. Stephanie is still a drama queen and clingy ex-girlfriend to Trevor, despite the fact that, in Addie's present eyes, she's a friend and a good companion to have during her brief vacation in the Norm world. Trevor and Addie still end up becoming attracted to each other even though they no longer have that history from Addie's forgotten Search path. Events change, but people don't change -- this is what I like more than fateful interventions of the "meant to be" persuasion. If I had any quibbles with Split Second however, it would probably be about the split POV narration. I'm already not the biggest fan of first person POVs. Given the choice, I'd rather read a book that was completely third person; first person is just so restricted to one person's view on the world and way too subjective. And so if you want to show the readers other events, you end up with multiple POVs. In this case, it was a switching back and forth from Addie to Laila. At first I wasn't sure if I was going to like the two person narration. But then again, I said the same thing about Addie's separate Search narrations of two different pathways from Pivot Point (and THAT ended up as a very clever and appropriate way to tell the story). However, even after finishing Split Second, I'm still not sure how much I liked seeing the two separate first person narratives. I think there may have been a point that I told myself I didn't care to think about it anymore because I was simply enjoying the story as a whole so much. Don't get me wrong, I loved being able to see Laila's point of view and getting to know her a little better. It's just that, both girls have such similar voices that there were a few moments that I found myself a little confused as to which voice was who--this was towards the end of the book when the girls were actually in the same places together and the POV's got a bit confusing. But that would be my main complaint. We know that Addie and Laila are two different girls with two different personalities (one's a nerd and the other is spontaneous), but the voice of their narrations were too similar to be able to separate as two different entities. Both had the same sarcastic tones and dry senses of humor with random, nonsensical one-liner thoughts. Maybe best friends sometimes DO think alike. I wouldn't know. My best friends and I have fairly different personalities that even were we to write a book together, we'd have pretty different tones of voices. Or maybe not. It's hard to say. So while the voices were too similar to one another, I'm not really saying that I didn't enjoy it. Another complaint might also be that the plot wasn't as exciting as the one from the first book--which is strange since there's so much more conspiratorial action going on. So... let's reword this: I, personally didn't find myself as drawn to the plot in Split Second as I had been for Pivot Point... for reasons. I know I probably shouldn't be comparing the two so closely, side-by-side, but it happens. Split Second's plot felt like it was all over the place. Despite everything coming together at the end, seeing things from two different POVs almost made the story points too scattered to keep track of. And I'm not sure if I'm all too excited about another conspiratorial organization/government/society type conflict in a YA novel where the kids are the ones who manage to outwit adults and save the day. Then again, I guess that's what makes YAs so much fun. I'm a complicated person to please. It's okay, let's just stick with how much I loved this book and we'll be fine. Anyway, I'm ready to take on Kasie West's next book. Soon. So it's fortunate that so far, the Pivot Point series has proven a penchant for well-rounded conclusions in both books; no cliff-hangers or the like that get you all riled up and wanting the next book RIGHT NOW. Granted, I would probably still want the next book immediately, but at least I'm not cursing the restrictions of the space-time continuum.